Jenny Graham has broken the world record for the fastest female unsupported world circumnavigation, wearing Endura. 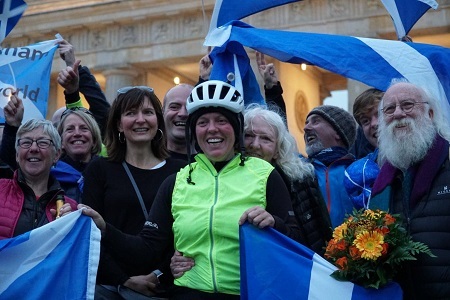 The Scottish endurance cyclist arrived back in Berlin on October 18, after riding for 124 days around the globe, beating the former world record by almost three weeks. 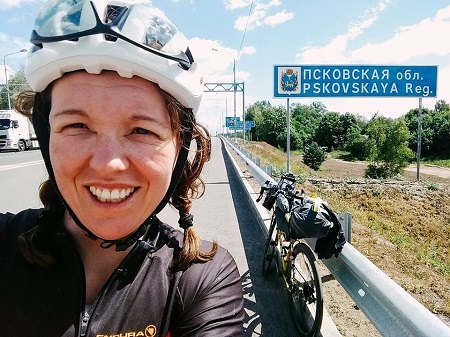 The 38-year old member of The Adventure Syndicate set out from Berlin on June 16 at 6am to cycle 18,000 miles across four continents. Travelling east through 16 countries, she faced bear risk in Canada, close-passing lorries on the Trans-Siberian Highway and sub-zero temperatures of the Australian winter. Riding continuously for this length of time not only takes its toll on the athlete, it also demands a lot of your kit – comfort and durability were obviously key, with Jenny’s customized Wms Pro SL Bibshort living up well to the challenge, and the drop-seat function made pit-stops quicker and easier. Travelling self-supported and carrying all her kit herself, the long-distance rider also had to pack and layer up cleverly to conquer several climate zones and adverse weather conditions, plus the kit had to be lightweight. A Fishnet baselayer and Wms Custom Jersey was the basis of her upper half outfit, delivering fast moisture transfer and drying quickly. The lightweight Pro SL Primaloft Gilet kept Jenny warm, while the super packable MTR Shell Jacket held the rain off. There were even days when new record holder wore all her kit at once. Endura’s lightweight FS260-Pro Helmet protected Jenny’s head while the Stella Glasses shielded her eyes.